Singing to the Festive Spirit and Joy of Christmas with A Delicious Feast! Counting down to the coming festive holiday season calls for loads of celebrations and indulgence. 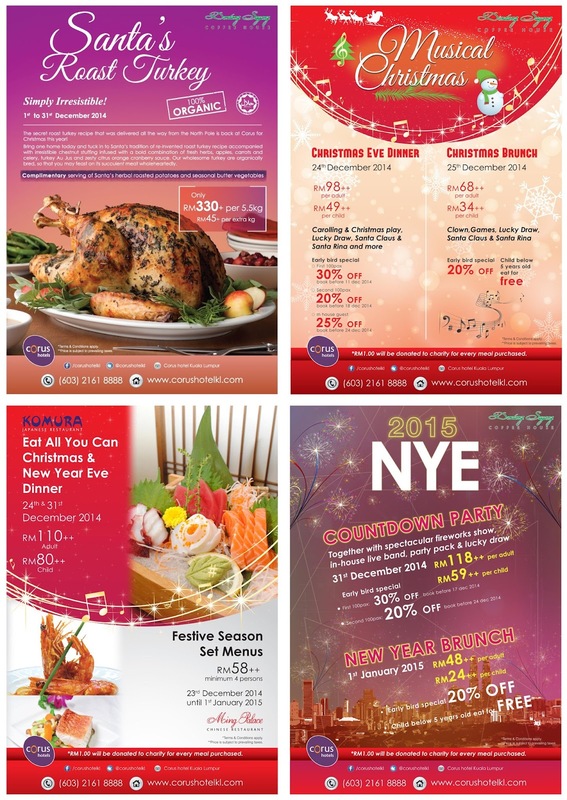 This year, Corus Hotel Kuala Lumpur has a list of treats for everyone singing their way into the Christmas and New Year at all their F&B restaurants and outlets. Kicking off the list is A Secret Recipe from Santa Claus! Make your order and tuck into Santa’s tradition of re-inventing Roast Turkey to be accompanied with their irresistible Chestnut Stuffing, Turkey Au Jus and zesty citrus Orange Cranberry Sauce. Each Roast Turkey purchased also comes with complimentary Roasted Potatoes and seasonal Buttered Vegetables. Each turkey is priced from as low as RM330+ per 5.5kg bird and RM45+ per additional kg. The promotion is available from now until 31 December 2014. If you are not having a home gathering, then simply head on over to Dondang Sayang Coffee House for their Santa’s Workshop Christmas Eve Buffet Dinner for a taste of the succulent Roast Turkey with all the trimmings. The all-day dining will be hosting a spread of holiday dishes and our sneak preview of the feast was a lovely and enjoyable one. Besides the Roast Turkey, there will be Herb Marinated Roast Beef, Chef’s Favorite Lamb Stew, Roast Lamb Leg with Rosemary Sauce, Gratinated Baked Mussel and Grilled Salmon with Dill Sauce. Besides the buffet, live station featuring a choice of Beef, Lamb, Squid and King Prawns are grilled to order and served with BBQ sauce, Black Pepper sauce and Mushroom sauce. Nothing feels better than a hot and warming soup for the holidays. We savored a hearty Pumpkin Soup that is beautifully creamy and comforting. Or savor an old school classic of Prawn Mango Cocktail that is an all-time favorite of mine. Don’t forget, every festive feast should always have a sweet ending. Check out the dessert station for Christmas sweets like Christmas Stollen, Yule Log, Cookies, Christmas Pudding, Fruit Jelly and Mini Assorted Cakes. There are also plenty of other dishes available at the restaurant besides the highlights of the festive feast above. Besides the feast, your Christmas Eve evening will be accompanied by Santa and Santarina delivering Christmas goodies for everyone. In-house trio, Music Notes will also be caroling festive songs for a musical Christmas at the hotel. Musical Christmas Eve Buffet Dinner starts at 7pm on 24 December 2014 and is priced at RM98++ per adult and RM49++ per child. In-house guests get an exclusive 25% discount. Christmas Day Brunch at Dondang Sayang Coffee House is priced at RM68++ per adult and RM34++ per child. Kids below 5 years old dine for Free! In conjuction with this month of giving and the celebration of joy, Corus Hotel Kuala Lumpur has organized a fund raising campaign to raise money for the underprivileged children of selected orphanage homes. For every purchase of Musical Christmas Eve Buffet Dinner held on 24 December 2014 at Dondang Sayang Coffee Hourse, Corus Hotel will donate RM1 from the sale proceeds as part of the hotel’s on-going corporate social responsibility (CRS) project to support the children’s daily living expenses in orphanages. Go ahead and make a difference in someone’s life this festive holiday! Make your reservations or ask for further enquiries on special discounts and offers given to selected credit card holders at the individual restaurants at +60 (3) 2161 8888 or visit www.corushotelkl.com for the latest F&B and room promotions.